This article will provide you with the information of modern periodic table. You will find the modern periodic law. You will also find the importance of modern periodic table. To know about the modern periodic table, please read this article. In 1911, Moseley discovered atomic number. According to him, physical and chemical properties of elements do not depend upon atomic weight but on atomic number, that is the number of protons and atomic number is the basic properties of elements and not atomic mass. Therefore, Moseley considered atomic number as the basis of classification and not the atomic weight. Moseley proposed the modern periodic law according to which the physical and chemical properties of elements are the periodic functions of their atomic numbers. It means that when elements are placed in increasing order of their atomic number then after regular interval elements of same properties are repeated. Mendeleev's periodic table was based on atomic masses while in Modern periodic table elements were arranged in the order of increasing atomic numbers in seven horizontal rows (period) and 18 vertical columns (groups). Elements of a group possess similar valence shell electronic configuration hence they exhibit similar chemical properties. Study of the electronic configuration of different elements revealed that there is a close relationship between the electronic configuration of elements and their properties. On placing elements in increasing order of their atomic number, elements of the same configuration appear after regular intervals. As a result of which elements of similar properties also appear after regular intervals. Hence periodicity in the properties of elements at a regular interval of atomic number is due to the repetition of similar valence shell electronic configuration. Considering electronic configuration of elements Werner, Bury, Rang, etc. proposed modern periodic table or long form or extended form of periodic table. This table is also called Bohr's periodic table since Bohr, first of all, described the arrangement of electrons round the nucleus of an atom. Like Mendeleev's periodic table, the modern periodic table also has seven blocks which are called periods. They are numbered 1, 2, 3, 4, 5, 6 and 7 from top to bottom. The number of a period is in accordance with the highest principal quantum number of the elements in the period. 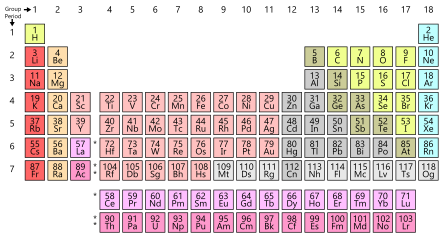 First is very short period containing two elements, second and third are short periods containing eight elements each, fourth and fifth are long periods having 18 elements each, sixth is very long period having 32 elements out of which 14 elements are placed in a horizontal row below the table seventh is incomplete period having 28 elements. Theoretically, there should be 32 elements, rest of the elements are yet to be discovered. Apart from it, the sixth period has 14 elements (atomic number 58 to 71), which are called lanthanides and the 14 elements of the seventh period (atomic number 90 to 103) are called actinides. They are kept in separate rows at the bottom of the periodic table. According to IUPAC system, first seven columns from IA to VIIA, next three are of VIIIA group, then next seven from IB to VIIB and the last column is called zero group. Afterwards according to CAS system, groups IIIA to VIIA were named from IIIB to VIIB, all three columns of VIIIA were called VIII groups and IIIB to VIIB were called IIIA to VIIA and zero group was called VIIIA. According to modern IUPAC system, naming of A and B is not in use and 1-18 columns are considered as 1to 18 groups. Metallic and non-metallic elements have been separated. Strongly metallic elements (s-block elements) are placed on left side of transition elements (d-block elements) in group 1 and 2, transition elements are placed from 13 to 12 and non-metallic elements (p-block elements) at the right of transition elements from group 13 to 17. On the basis of filling of electrons in elements, all elements can be divided into s-block, p-block, d-block and f-block. Transition elements have been separated from normal elements. There elements are situated between s-block and p-block. In them last electrons are filled in (n-1) d orbital hence, their properties show more similarities. Lanthanides and actinides are given appropriate places in the modern periodic table. Two subgroups of the same groups are placed separately. Hydrogen is placed in group 1 at the top but without including in the group. This table show a relation between position of elements in periodic table and their atomic configuration, as a result of which their study becomes easier. Position of hydrogen : Since, this table is based on electronic configuration hence, the position of hydrogen is considered in s-block. Presence of high atomic weight element before low atomic weight element : In Mendeleev's periodic table, Ar is placed before K, Co before Ni and Te before I whereas their atomic weights are greater than the preceding element which is not valid according to Mendeleev's periodic table but their atomic numbers are less than the next element hence, in modern periodic table Ar, Co and Te must be placed before K, Ni and I, respectively. Position of isotopes : As isotopes of same elements are almost identical hence, they should be placed at one place, but according to Mendeleev's periodic law their position cannot be the same since atomic weight are different. In long form of periodic table, isotopes are placed at one place because their atomic numbers are same. Position of inert gases : In long form of periodic table, inert gases are placed between strong electronegative elements (group 17) and strong electropositive elements (group 1) which is appropriate. Diagonal relationship : Diagonal relationship can be shown on the basis of electronic configuration and atomic radius. Position of rare earth elements : In Mendeleev's periodic table, 14 elements (lanthanides) after lanthanum are placed at one place due to the similarity in their characteristics. In the same way, 14 elements (actinides) after actinium are placed in one place which is incorrect as their atomic weights are different. Hence, these are placed at the bottom of main table which is appropriate. Placing of dissimilar elements at one place : In modern periodic table elements of dissimilar properties are clearly separated from each other. Position of lanthanides and actinides is not clear. Elements having similar properties like Cu and Hg, Ba and Pb are placed in different places. The clarification for this has not been given yet in the modern periodic table. The basic difference between the old periodic table and the modern metallic table is well explained in the write-up. Atomic mass of an element is also dependent on an atomic number. In many cases the higher the atomic number higher the atomic mass. As such the sequence followed in both the tables is almost same except a few changes. The chemical reactivity of a particular element is depending on the atomic number than mass. So it is more logical to follow the modern periodic table which is definitely a refined format of the original periodic table.